Mars Talismans can bring you self-assertiveness, motivation and courage. The ring is made of solid sterling silver. The gem is natural red untreated CARNELIAN. Every gemstone is unique, so the colors can slightly vary from what you see on the picture. This ring is from approximately 1800 and comes from Yemen. The ring is unique and only antique ethnic piece. The ring will be ritually purified before the consecration ritual. 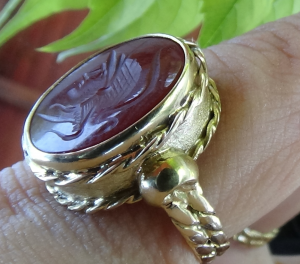 The magic symbols and characters of Mars will be engraved on the top of the ring directly on the gemstone. The esoteric symbol of Mars will be visible. On 2nd November 2018 on a night/hour of Mars I will be consecrating very powerful Martian talismans. More about this you can find HERE. The ring is made of sterling silver. The gem is a natural dark wine red HESSONITE GARNET. Every gemstone is unique, so the colors can slightly vary from what you see on the picture. The magic symbols and characters of Mars will be engraved in the back/down side of the ring, so that they remain secret for the public eye, but will touch the finger. This ring will be handmade and is a unique model from the collection of a Bulgarian jeweler. The talisman ring is made of 18 carat massive gold. 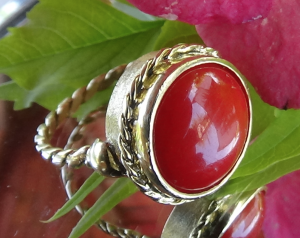 The gem is a natural untreated red CORAL from India. The magic symbols and characters of MARS will be engraved in the back/down side of the seal, so that they remain secret for the public eye. This is a unique, only one model from the Roman replica collection of a famous Bulgarian jeweler. The ring is made of sterling silver in 1970. The gem is a natural HESSONITE GARNET. Every gemstone is unique, so the colors can slightly vary from what you see on the picture. The magic symbols and characters of ALDEBARAN will be engraved in the back/down side of the ring, so that they remain secret for the public eye, but will touch the finger. This ring will be handmade and is a unique model from the collection of a Danish jeweller. This is a talisman ring made of massive 18 carat gold. 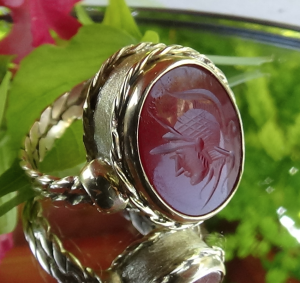 The gem is a natural CARNELIAN, on which an ancient Greek soldier is engraved by hand in order to create this unique INTAGLIA that used to serve the role of a personal seal in antiquity.